[Stride] (Released when both players' vanguards are grade 3 or greater! )-Stride Step-[Choose one or more cards with the sum of their grades being 3 or greater from your hand, and discard them] Stride this card on your (VC) from face down. 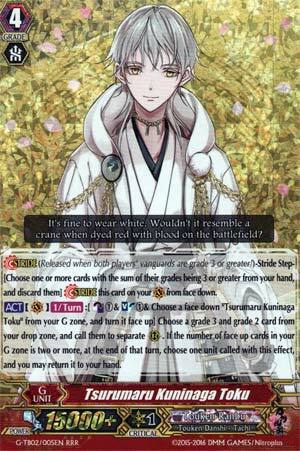 [ACT](VC)[1/Turn]:[Counter Blast (1) & Soul Blast (1) & Choose a face down card named "Tsurumaru Kuninaga Toku" from your G zone, and turn it face up] Choose a grade 3 and 2 card from your drop zone, and call them to separate (RC). If the number of face up cards in your G zone is two or more, at the end of that turn, choose one unit called with this effect, and you may return it to your hand. Introducing Legendary 99th Nightrose. With Afterimage on a rearguard. Tsurumaru Toku is a nice mid-game option, especially if your opponent got first Stride and you G-Guarded during their Stride turn. He's good resource management for when you know you're not gonna kill the opponent, and when you know you're gonna need more cards in hand. It's also nice to clear a rearguard circle against control matchups instead of leaving something out to die or get locked. He is most definitely not a game-ender, so you can get by with 2.